Veganism has officially taken over. A whopping 250,000 people took the Veganuary pledge this year with ‘veganism’ receiving almost three times more Google hits than ‘vegetarianism’ and ‘gluten free’. More and more people across the UK are warming up to the thought of meat-free meals and dairy-free treats, with 92% of all plant-based meals in the UK being consumed by non-vegans. Whether you’ve taken the plunge into a completely vegan lifestyle, or if you are intrigued by the numerous benefits of ditching the dairy for good, read on for our favourite selection of vegan restaurants in London, with food so tasty you’ll forget it’s made out of plants. If you think vegan food is all about chia seeds and sad-looking salads then Club Mexicana are here to prove you wrong. Located at The Spread Eagle in Homerton (London’s first fully vegan pub), Dinerama in Shoreditch and Netil Market in London Fields, these junk food mavericks are changing the way vegan food is perceived. Expect ‘tofish’ tacos, fully loaded nachos, chick’n wings, ‘chorizo’ tortillas and chick’n burritos, and sweet treats such as tequila pie and lemon and raspberry tacos. Eat Chay was founded by two university graduates spotted a gap in the market for delicious and fresh tasting Asian food that had no animal products in it at all. It all started with a small food truck in Brick Lane, and today you can find them serving up delicious Asian cuisine at Boxpark Shoreditch, Borough Market, Brockley Market, Vegan Nights and at various other pop-up locations around London. One of their most popular dishes (and potentially our favourite) is the Korean BBQ Bahn Mi. A freshly baked baguette is filled with marinated seitan (fermented gluten – it tastes better than it sounds), kimchi, crispy shallots, cucumber, sriracha and fresh coriander, providing a hearty hit of flavour for only £8. Their fluffy little bao buns are also a true delight; enjoy them with tofish, Korean fried tofu or BBQ seitan, and with three buns only costing £10 it’s the perfect excuse to try all three! This Chelsea restaurant and bar is the brainchild of Lucy and Tiffany Watson of Made in Chelsea fame. Everything here is completely vegan, even down to the spirits they use in their cocktails, and the wine behind the bar. Serving breakfast every day from 10-12, weekend brunch until 4, and three types of vegan Sunday roast, this is the perfect spot to catch up with friends, take non-vegan family members for a roast or grab a vegan cocktail and a few light bites after work. They also serve a selection of sweet and savoury pastries at the coffee counter to eat-in or takeaway so even if you’re just popping by you can grab a taste of the TYF action. If you’re craving vegan junk food without meat alternatives then head to The Vurger Co in their main home in Shoreditch, or their brand new home in Canary Wharf. Their menu focuses around four burgers (The Classic, The Auberger, The MLT and The Habanero), a selection of fries, mac n cheese and vegan milkshakes. All packaging is fully compostable, so even if you’re having their food to go you can rest assured that you’re not damaging the environment whilst enjoying your favourite junk food! Speaking of their milkshakes, they have to be tasted to be believed. Alongside classic flavours such as strawberry and vanilla, you can try Lotus Biscoff, Oreo, and banana caramel with the extra addition of whiskey or rum. A word of warning, these burgers are big, juicy and messy so don’t wear white! If you came to veganism to enjoy all the health benefits that it offers then Redemption Bar is the perfect choice for an evening meal or after-work drink. The founders of this free-from restaurant wanted to create a place where people could socialise without compromising their health and so subsequently all of the food they serve is wheat free, sugar free and vegan, with an alcohol free bar. Their ethos is rooted in being as ethical as possible, meaning everything they do benefits the planet, animals and most importantly yourself. They have a weekend, daytime, evening and drinks menu with dishes such as pulled BBQ jackfruit burger, brown rice bolognese, kale caesar salad and a tempting range of healthy sweet treats. Find them in Shoreditch, Notting Hill and Seven Dials with their very Instragrammable interiors and signature angel wing mural. Avid Instagram devotees might recognise by CHLOE. as being the place to be seen in New York and California for vegan cuisine. If you like to spend your weekends at a somewhat leisurely pace then by CHLOE. could be the perfect spot; classic brunch dishes such as pancakes, scrambled tofu, smoothie bowls and sausage and tofu sandwiches are all available until 4pm on Saturday and Sunday. Must-try dishes from across the pond include the pesto ‘meatball’ sub sandwich, mac n cheese, avocado pesto pasta and the classic burger, with UK specials tofish and chips, the Royal Roast and sticky toffee pudding. A range of salads, smoothies, handmade cakes, cookies and muffins are all available as grab and go options, with ‘pupcakes’ and ‘peanut butter biscuits’ on offer for your four-legged companion. 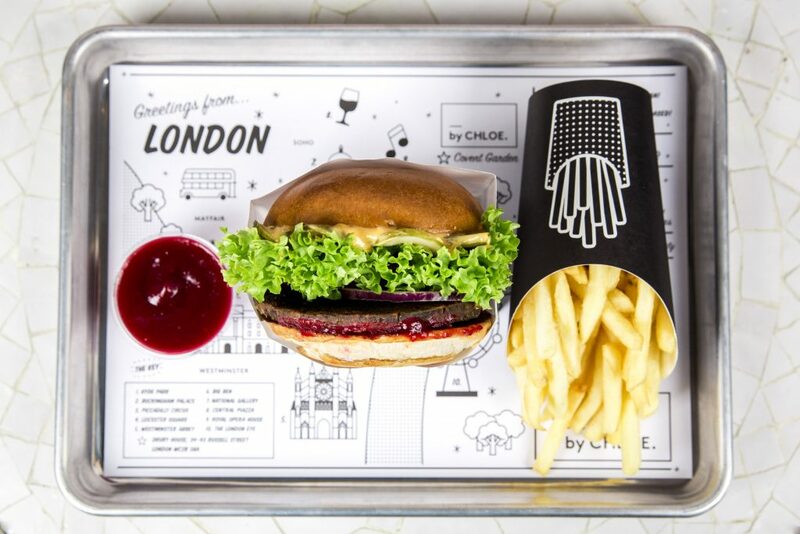 Their first 70-seater UK restaurant in Covent Garden has proved to be a huge success and with a recently opened London Bridge branch they are sure to slowly take over the London vegan scene. Make sure your phone is fully charged before dining as you’ll want to take a lot of pictures in this Instagrammable hot spot. If you visit any of the above or find somewhere new, we’d love to know! Tweet us here.